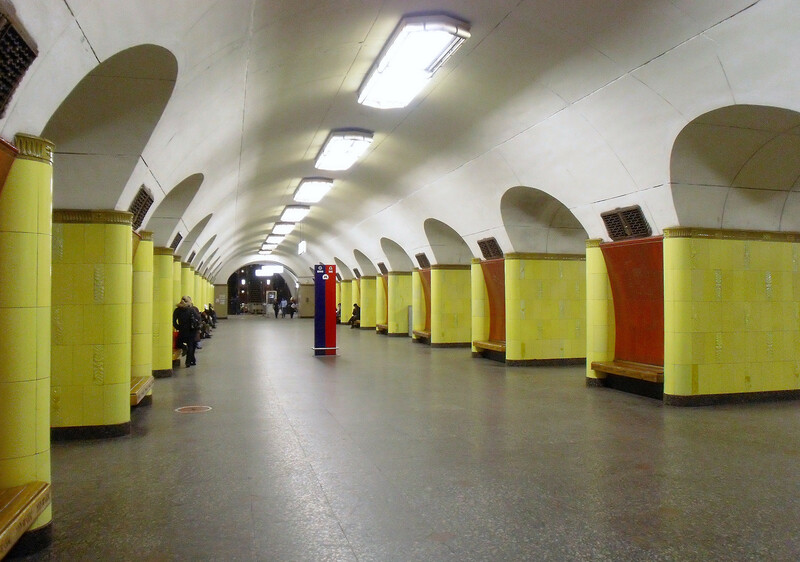 Russia Beyond presents the most interesting and colorful stations of the Kaluzhsko-Rizhskaya (aka Orange) Line. The interior decoration of Medvedkovo station is devoted to the severe and unforgiving nature of the Russian North. On the walls one sees eight metallic bas-reliefs with a polar bear on an ice floe, the hunt for snow gooses, reindeer sledding and more. This is one of the most lavishly decorated stations on the Orange Line. The walls have 48 mosaics devoted to Russian cities that surround Moscow, including their coats of arms. Near each mosaic stands the name of the city. 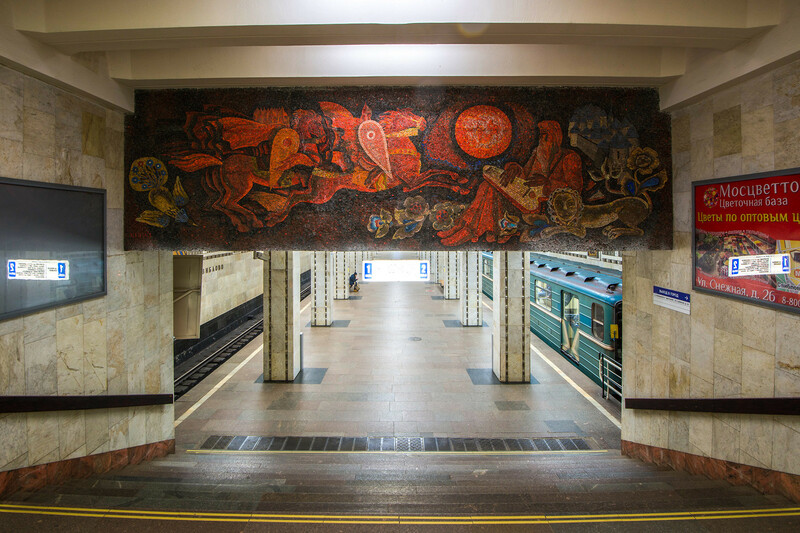 There’s a large colorful mosaic of girls in traditional Russian dresses above the entrance to the platform. The image on the opposite side depicts medieval Russian horsemen and a chronicler. This image is devoted to the ancient epic Slavic poem, The Tale of Igor's Campaign. This station brings one to the largest botanical garden in Europe, and the station’s interior decoration is devoted to the topic of natural beauty. 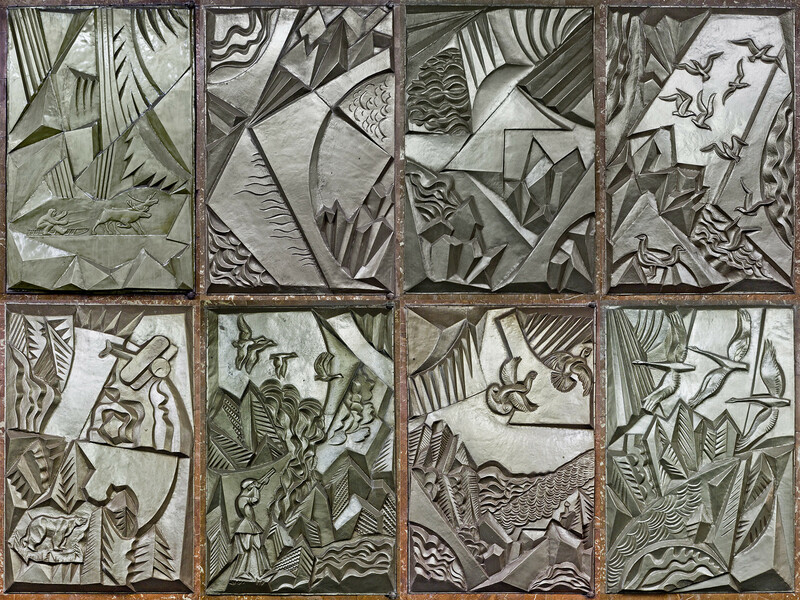 On the walls, one sees metallic bas-reliefs with simple images of flowers, apples and grapes. Rizhskiy Railway Station is located at this metro stop. From here, trains travel to the Latvian capital. 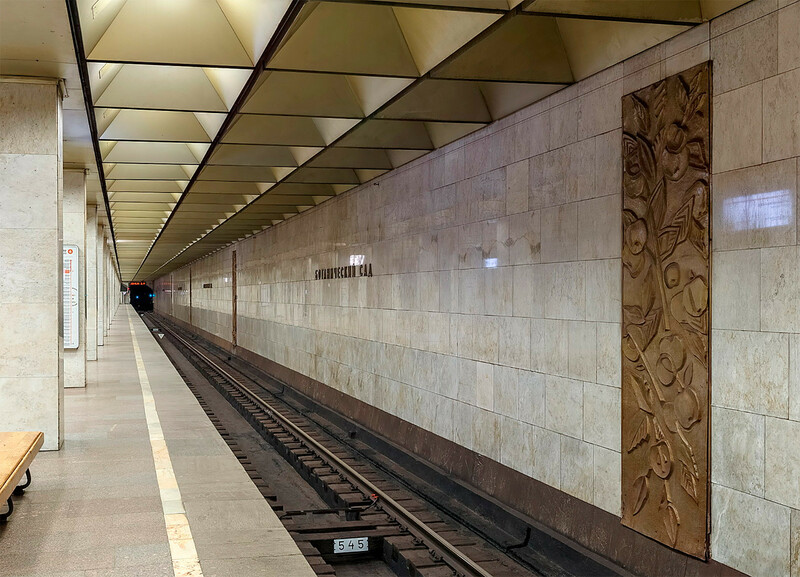 No surprise that the station, which was designed by the Soviet Latvian architects, was dedicated to that Baltic country and its capital, Riga. The yellow and brown colors epitomize different kinds of amber that is plentiful in the Baltic Sea region. On the columns one sees images related to Latvia: Riga’s port, the Latvian Academy of Science, the Central Market (one of the largest in Europe), Old Riga and more. This station leads to the famous State Tretyakov Gallery, the foremost repository of Russian fine art anywhere in the world. 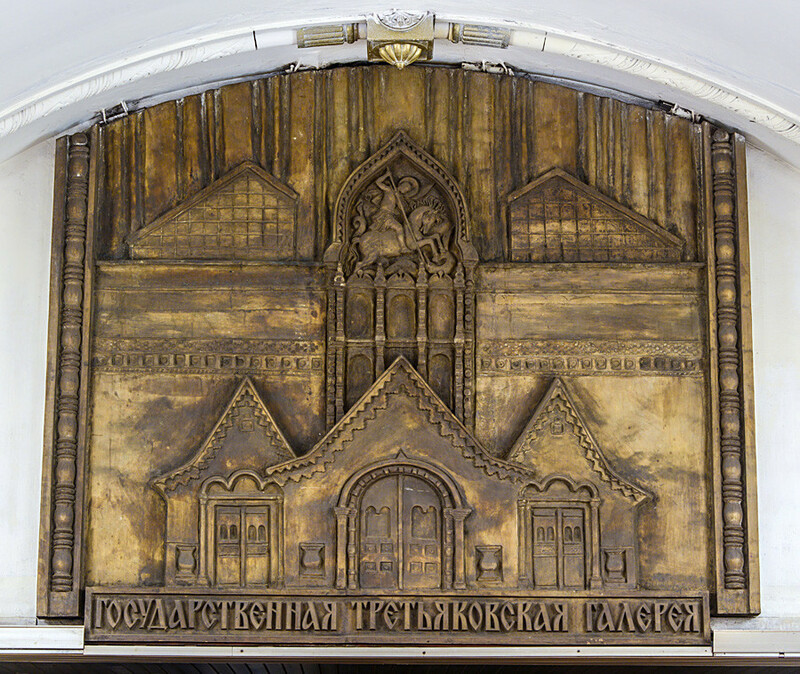 The station walls are decorated with the bronze bas-reliefs of Russian artists, sculptors and icon painters. Above the portal on the way to the escalators one sees a large image of the Tretyakov Gallery. This station brings you to the famous Exhibition of Achievements of National Economy (VDNKH) – one of the world’s largest exhibition centers. During the Soviet period it represented the best industrial achievements of all Soviet Republics. Today, it offers visitors a wide range of activities, from shopping to shows and skating, and other sport activities. Despite its name, the station is modestly decorated. At the exit one sees a huge modern (1997) ceramic image. Made according to traditions of the Old Russian style of Gzhel, the image depicts the 19th century market, as well as several Russian monasteries. 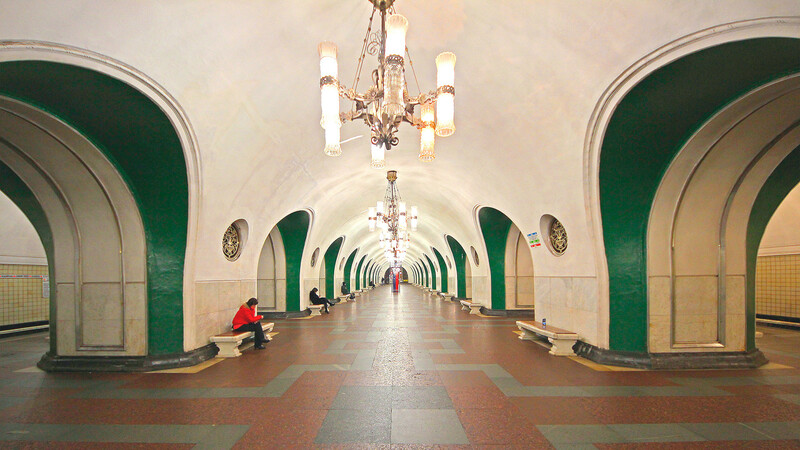 Besides Moscow and St. Petersburg, several other Russian cities have metro systems, and most stations are masterpieces of art and architecture. Find out more about them.